I couldn’t get up to save my life this morning. My laptop sang to me and sang to me and I sang along, but I could not motivate myself to shove the comforter off of me. I really love this couch bed. In fact, I have never met a couch bed I didn’t love. When I’m rich and famous in a few months time, even with all the money in the world, I think I will go and buy myself one. I mean, of course, I will buy massive antique beds as well for the guest rooms, but I love couch beds. Love, love, LOVE them. Anyway, I couldn’t move. So, I did a bit of light reading. Jessica decided to go off and be daring. I applauded her for this, she doesn’t like to move let alone leave the house so this was a positive step in the right direction. She went grocery shopping and sightseeing and even bought a chicken on the street. She proceeded to eat said chicken in front of me as I watched on in horror. As a vegetarian, I no longer see tasty skin and juicy meat, I see a corpse. A horribly burnt corpse. It was vile. She left a plate of bones in the middle of the room and went off. I looked at the plate for a good long time–and I’m pretty sure it looked back at me. Organs and veins everywhere. It was horrible. As I tidied up the apartment, I noticed that somebody kept staring down into our window. I have nothing against voyeurism, I enjoy studying the neighbors as well, but I at least have some subtlety. I had to resist the urge to dance around naked just to see what would happen. I did resist, but whoever it was kept watching. It was actually creepy after awhile, no longer flattering. This must be how celebrities feel. 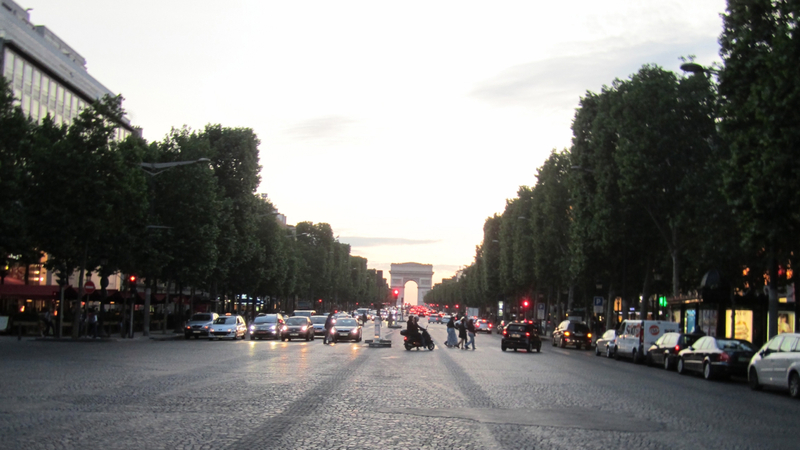 As seven o’clock neared, the lazy day sped up and we made our way down to the Champs-Elysées to go and see the new Pirates of the Caribbean movie. When we finally found the theater and paid the crazy price, I enjoyed studying the theater and comparing it to America. It is smaller, much more tidy, much more comfortable, and much darker. It was pitch black when the lights went down. I liked this. We were behind yet another group of annoying Americans in line–the only kind in Paris, it seems–to get tickets and then again at the snack bar. I got a Magnum bar (double chocolate!) and Jessica had popcorn. This was the first film I have seen in 3D and I was deeply impressed. It doesn’t look crappy like those red and blue cardboard glasses–it looks real. It looks more real than reality and that is why I’m not sure I understand the point of it. There was no real reason that the movie needed to be in 3D, it didn’t make the movie more exciting, it only subtly enhanced the visuals, I suppose. I enjoyed it. The Magnum bar was good, too. I really liked the movie, the series has redeemed itself after those last two miserable spectacles Disney put out. They did not make a moment of sense, but this seemed to be a standalone installment with only the vaguest of connections to the previous films. The missionary and the mermaid were deeply annoying, though. What was their purpose? It seemed an exhausting plot diversion to get a tear. Tell the damn mermaid a funny joke, don’t stab it, run it through a jungle, pretend to slaughter its lover and whatnot. Exhausting. After the movie, Jessica wanted to go to the candy store again, so we did, and she loaded up on gelatinous octopi. Creepy. We also went into the Virgin store to waste some time and to look around. I enjoyed looking around the books of photography–I can’t believe people buy them! I should sell books of photography (just wait until you hear about one of the books I saw at 7L in a few days–I’m writing this from the future). On the way out, I noticed a poster of Gaga. Being an admirer, I stopped and admired then let out an exclamation of joy. There was going to be a Gaga lookalike contest followed by a Gagapalooza. Joy of joys! So, now I know what we will be doing at 10pm on Sunday. Rocking out with Mother Monster lookalikes. I enjoyed looking at people’s pants on the way home on the Metro. At first, I was always curious about why Levis prints the sizes on your bottom. Now, I realize it is so that you can judge them and feel superior. Hey, Mr. 34 Inch Jeans–I’m thinner than you. In your head of course. 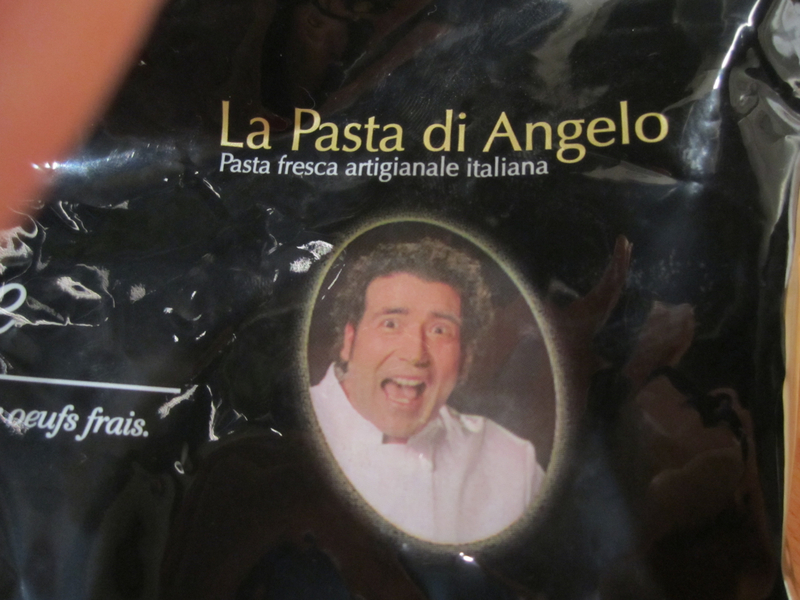 I liked the bag of pasta.